Tony writes: Mine has been a summer of grill-braising. I know; I should have just gone to the beach or hiking, gotten a little sun. But grill- braising offers its own (simple) thrills. Just grill meats, fish, and vegetables until they brown and pick up some smoke, then chop (where applicable) and transfer to a waiting pot of broth to finish cooking (right on the grill if you like). My latest efforts involve a spicy pot of clams and sausage. 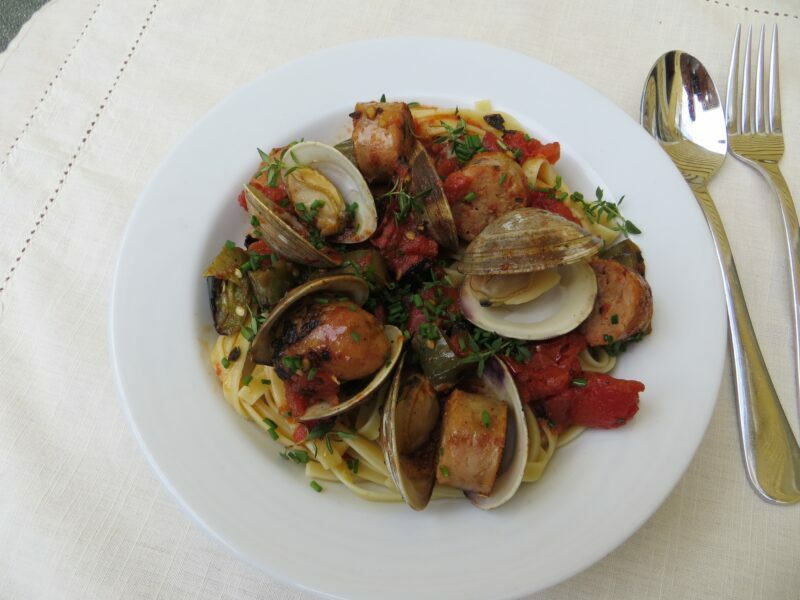 The richness of the sausage complements the tender clams while smoky tomatoes and spicy jalapenos fill out the broth. Serve with a crusty baguette or over a bed of pasta and feel the rush. Grilling clams is easy and allows you, in a sense, to cook each bivalve individually (so it smokes/roasts/steams to a perfect doneness: tender with all of its sweet juices pooled in the bottom shell). Grill the clams over a hot zone of the fire until they start to crack open. Gently flip and cook another minute or so until the heat fully coaxes open the shells (all in, about 5 minutes). The last step is the most important. Carefully transfer the open shells to the pot of broth so their precious, briny juices reach the pot and don’t fall to the grill below; kind of like toting a couple of shots to friends in a crowded bar, but not, of course. The technique: This method consists of three basic steps: first, grill the base for the broth. 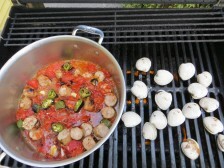 Brown plum tomatoes, Italian sausage, and whole jalapenos over a hot part of the fire. Then make the broth and grill the clams (simultaneously). Transfer the grilled base to a cutting board to cool for a couple of minutes, before chopping up and pairing with sauteed garlic and white wine. Meanwhile, grill the clams until they just open. Pass the cooked clams to the tomato-sausage broth and cook together for a couple of minutes so all of the flavors marry. 1. Prep and grill the base for the broth: Prepare a medium-hot charcoal fire or heat the burners on a gas grill to medium high. Rinse 2 1/2 lb. littleneck clams (or other small clam, about 25 ea) under cold running water (if they feel particularly gritty, soak for 10 min. in a couple quarts of cold, well salted water with 1/4 cup cornmeal. The clams will feed on the cornmeal and, while they do so, release any extra grit.). Toss 1 1/2 lb. plum tomatoes (about 10, cored and cut in half) and 1 to 2 jalapenos with 1 Tbs. olive oil and S+P (about 1/2 tsp. each) Then set on the grill along with 1 lb. 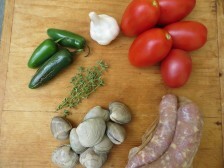 Italian sausage (3 to 4 links). Grill the sausage and vegetables, flipping after a couple of minutes, until browned (with good grill marks) but not necessarily cooked through, about 6 min. total; the sausage should still be raw-ish in the center and the tomatoes and jalapenos should just start to soften. Transfer to a cutting board to cool. Slice the sausage into 1-inch pieces and the jalapenos into thin rings and coarsely chop the tomatoes. 2. 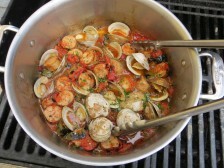 Start the broth and grill the clams: Make the broth by sauteing 3 cloves garlic (thinly sliced) with 3 Tbs. olive oil and 1 tsp. chopped fresh thyme in a large pot over medium-high heat (I use the grill itself) until the garlic starts to sizzle steadily and become fragrant, about 1 1/2 min. Add the sausage, tomatoes (and their juices), jalapenos and 1/3 cup dry white wine and cook, simmering and stirring, until the sausage cooks through and the tomatoes melt into a saucy broth, about 8 min. ; move to a cooler zone if the broth boils too aggressively. Meanwhile, set the clams over a hot zone of the fire and grill until they start to crack open ever slightly, about 2 min. Gently flip and continue grilling until the clams fully open, 2 to 3 more min. ; discard any that fail to open. 3. 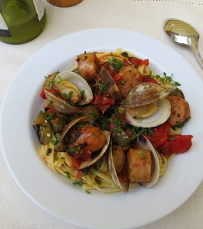 “Braise” and serve: As each clam opens, transfer it to the tomato-sausage broth. Cook for a couple more min, stirring occasionally, so the flavors mix and meld. Season the broth with salt and pepper to taste. Serve, sprinkled with more chopped fresh thyme (or 8 basil leaves, torn, if you have), over pasta or with a crusty baguette for sopping up the juices.